This page is a translated version of the page Tibaldi and the translation is 100% complete. 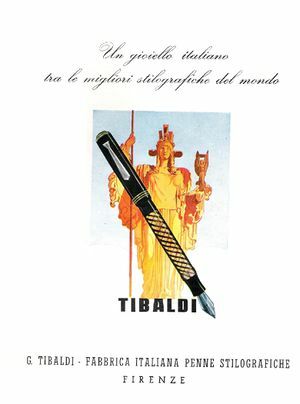 The Tibaldi was founded in 1916, and is one of the oldest manufacturers of fountain pens in Italy. The author considers the second among the oldest Italian manufacturer of fountain pens. If there were brands operating on the market since before this date, like Montegrappa or Nettuno, none of these can qualify in its early stages as a true fountain pens manufacturer apart Uhlmann's Eterno. After the death of the founder, the company underwent a period of decline, with a drop in quality and sales, failing to overcome the crisis of the advent of disposable ballpoint pens, closing its doors permanently in 1965, even if the mark has been reused in recent years for the production of some modern models. The Tibaldi was notable for the production of quality pens that could enable it to compete with American products which were then imported into Italy. Although the company has not made ​​significant innovations in technical terms, the pens produced have nothing to envy in terms of quality to those of other major Italian manufacturers, such as Omas and Aurora. Of particular value are the beautiful models in celluloid made ​​in the 30s, which are considered among the most beautiful ever made transparent celluloid pens. The Tibaldi was founded in Florence on October 20 1916 by Giuseppe Tibaldi as "G. Tibaldi e C." with headquarters in Via Madonna della Querce. The company was bourne by collaboration between Tibaldi, who was behind a family business enterprise, and Giovanni Benelli, a technician with extensive experience in precision mechanics which became the production manager and the director of the factory. Self-registerd as the First and most important Italian manufacturer of Fountain Pens the G. Tibaldi e C. is certainly one of the oldest factories Italian fountain pens; this record is disputed both by Montegrappa, which traces its origins to four years before, and Nettuno whose initial traces date back to 1911. Montegrappa, however, began production fountain pens only in the 20s, being born as a nibs manufacturer, and therefore cannot considered the first fountain pens factory, being in this back even to the Aurora. The Nettuno, from the limited data available, it appears to have been a simple family business where pens were assembled for their shop, the registration of the company is, however, as of 1916 for the Tibaldi and the actual production of fountain pens also in this case is to ask starting from the 20s, which again does not qualify as either factory fountain pens, nor as a producer to all effects. The only documented antecedent production is the Uhlmann's Eterno one, of which there are traces as early as 1913. The first produced models were black hard rubber safety pens, both plain and with metal overlay. Among these there were a special doctor's pen model that like the Omas one contained a thermometer inside the barrel. Tibaldi safeties remained in production with various modifications of the fall of Tibaldi until the 40s. But the most interesting in the early ones was the Perfecta model, produced in the early 20s, with a torsion filler and a complex safety system as the first example of automatic filling fountain pen. In this initial period, following a strategy adopted by many Italian producers, Tibaldi used an alternative mark, "The GTB Pen London", that following the xenophilous trends was masquerading itself as Anglo-Saxon company. With this mark were produced second tier pens, substantially identical, apart from the finish of the cap top and the knurls of the bottom, to the production marked Tibaldi. In the 20s, following a common trend for the Italian market, which saw a plethora of Parker Duofold imitations, also Tibaldi produced a new series of lever filler flat top pens, clearly inspired by this model. The new pens were made initially in hard rubber, and in a second time in celluloid. A special feature of these models is the presence of a production of hard rubber pens in special colors (like yellow/green, or blue) that is found only in the Waterman production. The celluloid introduction corresponded to the launch of a new line of pens, called Infrangibile whose production was maintained until the 40s. Albeit with different restyling and technical changes, as the switching from lever filler to button filler. The Infrangibile was joined, starting from the second half of the 30s, by other two lines, called respectively Lusso and Impero. This last was the flagship model of the company and was produced in two versions, the rare multi-faceted Poligonale, and the round Trasparente. For these models, equipped with a special button filler akin to the Vacumatic, have been used the most beautiful semi-transparent celluloid. Also in the 30s was performed a production diversification, with the creation of a special sub-brand, the Giti, clearly marked as Tibaldi production, dedicated to lower prices pens but still good quality. They were made with less developed finishes and poorer materials (with steel nib, plated or plain). These pens underwent many stylistic variations, reflecting those of the products of the leading brand, remaining in production until the 50s. In 1935, with Giuseppe Tibaldi death, the company underwent a period of great uncertainty going into the hands of his nephew, Giorgio Schiassi, who didn't had great interest in fountain pens production, so activities continued for several years without significant innovations up to the sale of the company, which took place in 1957, to Remo Pagliuca, a wholesaler who had had good success in the field of writing instruments, distributing pens with various brands from the Settimo Torinese district. After the war, production was centered on the Trasparente model, which was also restyled to take ogival shapes, more suited to new stylistic trends, remaining in production until the 50s. The pen has undergone several restyling, going to piston filler and, as a response to the Parker 51 success, it was also produced a version with hooded nib. But competition from low-cost plastic pens, and the beginning of the spread of disposable ballpoint pen began to weigh significantly on the fortunes of the company, with the change of ownership Pagliuca tried to boost production going to fully ogival shapes and to decrease prices also sought to streamline production through the use of parts produced in the district of Settimo Torinese, at the expense of great quality which until then had been a feature of the company's production. The new lines, characterized by ogival shapes, with metal and hooded nib, and the transition to plastic materials in plain colors, however did not have a great success, despite promotional the efforts made ​​by Pagliuca. In the 60s Tibaldi suffered a progressive decline until the closure in 1965. As with many other historical brands, the company was reborn recently ​​to exploit the prestige of its history in the production of modern fountain pens. 1916 the company is founded by Giuseppe Tibaldi in Firenze as G. Tibaldi e C.
Company web site, only marketing on actual models. ↑ at least the present knowledge of the author. This page was last edited on 8 July 2017, at 14:16.